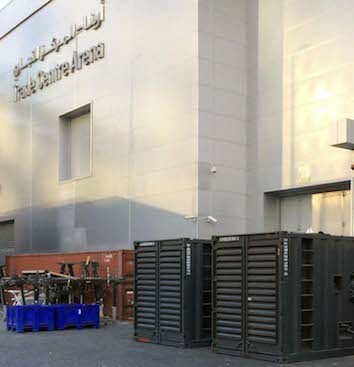 Energy Rentals were asked to provide power solutions for the Dubai leg of the Peter Pan – Never Ending Story World tour. House Power at The Dubai World Trade Centre was used to power the lighting, sound, video and automation equipment. Energy Rentals provided the main sound and video distribution system as well as providing all the power cables and distribution for 14 x 22,000 lumen projectors, this included 14 x individual feeds of 32amp single phase into the truss grid, using over 500m of 32amp cable. Energy Rentals also supplied all the cabling and distribution for the pyrotechnics used during the show, right down to the individual 16amp feeds in the desired locations. One of the main features of the show is a 871 horse power turbine that creates the impression that Peter Pan is flying, this turbine uses a whopping 1057amps per phase when it is up to speed, creating a wind speed of 150 miles per hour and capable of lifting a person of 150kg in body weight in its air stream. We ran parallel feeds of 600amp power lock to the turbines speed controller from the 2000amp main distribution panel at the supply end adjacent to the generators.